Tablet events are similar to mouse events; for example, the x(), y(), pos(), globalX(), globalY(), and globalPos() accessors provide the cursor position, and you can see which buttons() are pressed (pressing the stylus tip against the tablet surface is equivalent to a left mouse button). But tablet events also pass through some extra information that the tablet device driver provides; for example, you might want to do subpixel rendering with higher resolution coordinates (hiResGlobalX() and hiResGlobalY()), adjust color brightness based on the pressure() of the tool against the tablet surface, use different brushes depending on the type of tool in use (device()), modulate the brush shape in some way according to the X-axis and Y-axis tilt of the tool with respect to the tablet surface (xTilt() and yTilt()), and use a virtual eraser instead of a brush if the user switches to the other end of a double-ended stylus (pointerType()). Every event contains an accept flag that indicates whether the receiver wants the event. You should call QTabletEvent::accept() if you handle the tablet event; otherwise it will be sent to the parent widget. The exception are TabletEnterProximity and TabletLeaveProximity events: these are only sent to QApplication and do not check whether or not they are accepted. The QWidget::setEnabled() function can be used to enable or disable mouse, tablet and keyboard events for a widget. The event handler QWidget::tabletEvent() receives TabletPress, TabletRelease and TabletMove events. Qt will first send a tablet event, then if it is not accepted by any widget, it will send a mouse event. This allows users of applications that are not designed for tablets to use a tablet like a mouse. However high-resolution drawing applications should handle the tablet events, because they can occur at a higher frequency, which is a benefit for smooth and accurate drawing. If the tablet events are rejected, the synthetic mouse events may be compressed for efficiency. New in Qt 5.4: QTabletEvent includes all information available from the device, including QTabletEvent::buttons(). Previously it was not possible to accept all tablet events and also know which stylus buttons were pressed. Note that pressing the stylus button while the stylus hovers over the tablet will generate a button press on some types of tablets, while on other types it will be necessary to press the stylus against the tablet surface in order to register the simultaneous stylus button press. If the tablet is configured in xorg.conf to use the Wacom driver, there will be separate XInput "devices" for the stylus, eraser, and (optionally) cursor and touchpad. Qt recognizes these by their names. Otherwise, if the tablet is configured to use the evdev driver, there will be only one device and applications may not be able to distinguish the stylus from the eraser. This enum was introduced or modified in Qt 4.1. The pos parameter indicates where the event occurred in the widget; globalPos is the corresponding position in absolute coordinates. The tangentialPressure parameter contins the tangential pressure of an air brush. If the device does not support tangential pressure, pass 0 here. 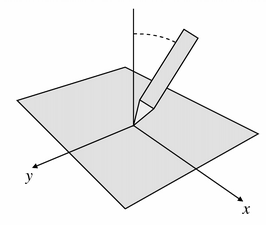 rotation contains the device's rotation in degrees. 4D mice and the Wacom Art Pen support rotation. If the device does not support rotation, pass 0 here. The button that caused the event is given as a value from the Qt::MouseButton enum. If the event type is not TabletPress or TabletRelease, the appropriate button for this event is Qt::NoButton. buttons is the state of all buttons at the time of the event. Note that the returned value is always Qt::NoButton for TabletMove, TabletEnterProximity and TabletLeaveProximity events. Returns the button state when the event was generated. The button state is a combination of buttons from the Qt::MouseButton enum using the OR operator. For TabletMove events, this is all buttons that are pressed down. For TabletPress events this includes the button that caused the event. For TabletRelease events this excludes the button that caused the event. Returns the global position of the device at the time of the event. This is important on asynchronous windows systems like X11; whenever you move your widgets around in response to mouse events, globalPosF() can differ significantly from the current position QCursor::pos(). If you move widgets around in response to mouse events, use globalPosF() instead of this function. Returns the rotation of the current device in degress. This is usually given by a 4D Mouse. If the device does not support rotation this value is always 0.0.